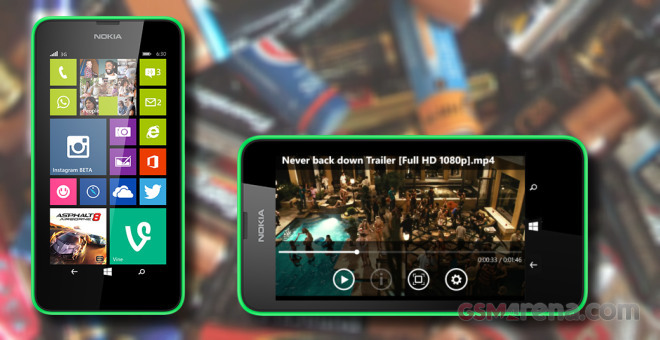 Nokia Lumia 630 is the first smartphone to run Windows Phone 8.1 out of the box. It is also the first WP handset ever to offer dual-SIM support, but we had the single-SIM version at our disposal. We weren’t particularly optimistic about the phone’s 1,830 mAh battery, but the quad-core Cortex-A7 processor should be quite energy-efficient. Anyway, Nokia promises 600 hours of stand-by or half a day on 3G talks in one charge. Let’s check if we can squeeze the same from our Lumia 630. Update, July 31: After we published the review, we spotted discrepancies in the methodology used for our testing so we re-tested the phone and it came up way better. Below are the amended test findings, which are noticeably better than before. Naturally, our first test is all about 3G calls. The Lumia 630 did well, lasting almost 13 hours and 20 minutes before its battery went flat. As we’ve already mentioned in our review, the Lumia 630 doesn’t come with a proximity sensor and if you want to achieve the score we did, you should make sure to switch the display off during calls. Nokia Lumia 630 packed enough power to last 10 hours and 18 minutes on our dedicated web browsing test. This is a great result for a smartphone of such caliber. Finally, the Lumia 630 managed to run 10 full hours on a looped playback before its battery level drops to the critical 10%. This is also an excellent result for such an affordable handset. Unfortunately, we couldn’t achieve the promised 600 hours of stand-by time, advertised by the manufacturer. We’ve tried our test three times and every time the Lumia 630 went dead at about 220 hours or so. It’s quite a poor result and hopefully it’ll improve with a firmware update. 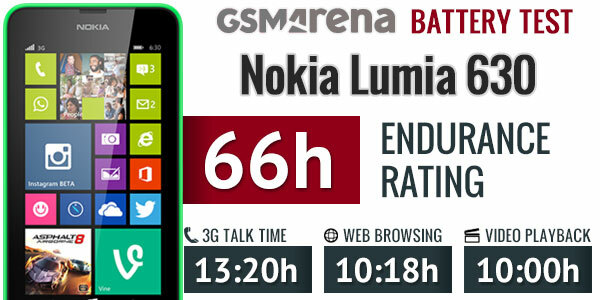 Nokia Lumia 630 final endurance rating as per our pre-defined usage pattern is 66 hours. It is a good overall rating and it means your phone will last a few hours short of three days if you used it for an hour of video playback, calling over a 3G network and web browsing each day. Check out our battery life test table to compare the Lumia 630 with the other smartphones we’ve tested and optionally customize the usage pattern.